Sarah Storey has reflected on her landmark 10th Paralympic gold medal as an incredible piece of history in her sporting career. The 34-year-old won the C5 individual time trial at Brands Hatch to add a fifth cycling gold to the five titles she won in the swimming pool at the Barcelona and Atlanta Games. She is now just one race away from matching the 11 golds won by British Paralympic greats Tanni Grey-Thompson and David Roberts. "Everyone is totting up the medals for me but I'm just taking it each race at a time," said Storey, who switched to cycling ahead of the Beijing Games. "Each race has got to be done, just to make sure I don't get too ahead of myself before I think about the wider picture. "Today it was just about getting around those 16 kilometres as fast as I could. It's added to an incredible history in my sporting life but it's come over so many years that I don't think those figures will settle in my head until I get home." 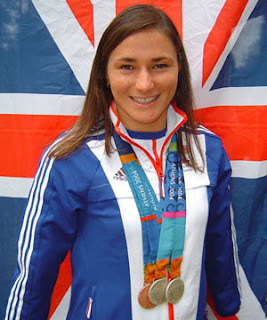 On the wooden slopes of the velodrome, Storey had already taken double gold in the C5 individual pursuit and and C4-5 time trial before adding a third gold on the road. Storey said losing was simply not an option after her British team-mates Bradley Wiggins, Chris Froome and Lizzie Armistead all won medals on the road at the Olympics. "Having watched the Olympic team on the road, I just wanted to make sure I added my name to that list of success," Storey said. "I just can't believe it. I really needed to nail this one here today." Storey now has a chance to make a golden clean sweep on Thursday in the women's C4-5 road race, which, like Wednesday's time trial, also finishes at Brands Hatch race circuit. But the Manchester speed machine wouldn't give anything away on her chances of success in the 64 kilometre (39 miles) race. "Who knows, it's a road race we'll see," she said.